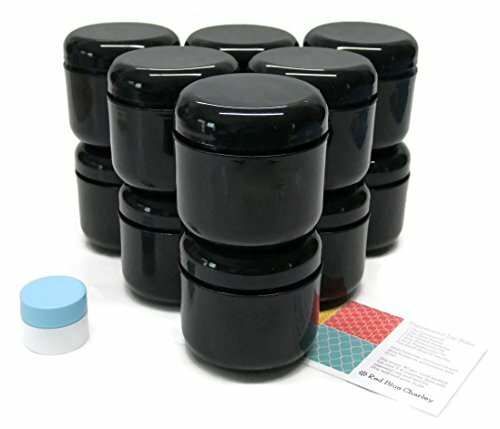 Includes 12 - 8 oz black refillable / reusable plastic jars. Perfect for travel, home and kitchen use, beauty, crafts and gifts. Low profile shallow jar makes contents easy to access. Black PET is fully opaque. A superior option for storage of essential oil blends or any product that will degrade with light (UVA / UVB) exposure. 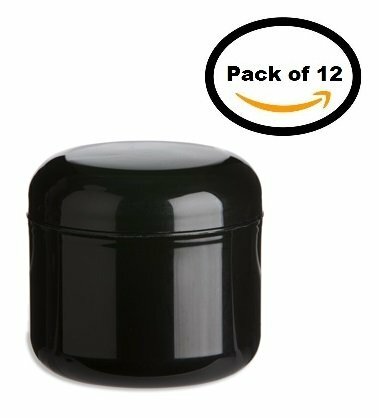 These top-quality affordable double wall plastic jars come complete with screw-on lids (including foam liners) that close nice and tight. And the durable polypropylene plastic holds up against bumps, drops and other minor impacts without shattering like glass jars. Plus, when you order these, you get a white mini jar and recipe! Our jars are perfect cosmetics, ointments, powders, creams and more. 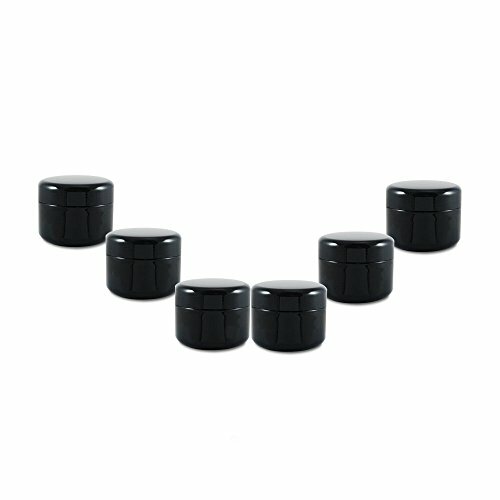 Order this 12-pack of plastic jars with screw-on lids from Red Blue Charley today! (Please note that PET temperature tolerances range from 0F to 240F and holds up well to hot liquids.) Shrink band sizes for this jar are 95-100mm wide or about 3 7/8" wide. 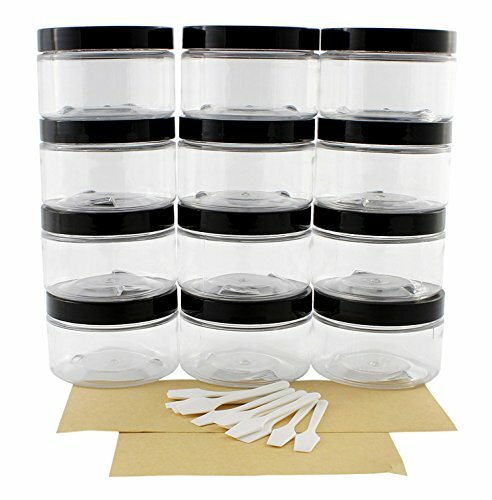 Includes 6 black refillable / reusable plastic jars. Each jar holds 8 ounces. Perfect for travel, home and kitchen use, beauty, crafts and gifts. Low profile shallow jar makes contents easy to access. Available in convenient amounts so you can purchase the quantity that's right for you. Premium quality, they hold up against bumps, drops and other minor impacts without shattering. And, close up nice and tight to keep air out. They are great for creating gift baskets for birthdays, Christmas, holidays, Mother's Day, Father's Day, anniversaries and even baby and wedding shower favors. Order yours from Red Blue Charley today! 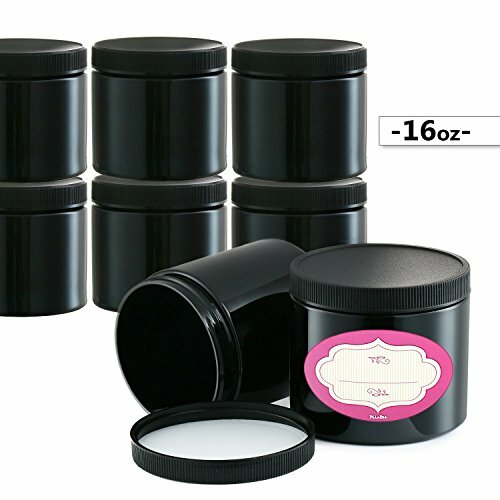 The best shrink band sizes for this jar are 115-125mm wide or 5 inches wide.